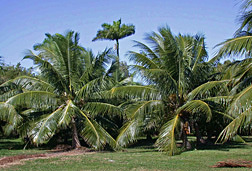 Two Fiji Dwarf (also called “Niu Leka”) coconut trees (foreground) at the Subtropical Horticulture Research Station in Miami, Florida. The taller palm in the background is a Royal Palm. Grown throughout the Tropics as a plantation crop, coconuts yield several important agronomic products, including the fruit and its processing byproducts. In the United States, coconut trees are a tropical ornamental plant that’s highly in demand as a signature landscape element—particularly in Florida. But in the 1970s, the lethal yellowing (LY) phytoplasma devastated the coconut canopy of South Florida and, by 1983, had destroyed about 100,000 coconut palms. Subsequently, the State of Florida Division of Forestry began a coconut-breeding program at ARS’s Subtropical Horticulture Research Station (SHRS) in Miami to try to solve the problem. Its objective was to develop new LY-resistant varieties and establish seed orchards of known resistant cultivars. Coconut germplasm was received from the Jamaican Coconut Board for breeding and disease-management studies at both SHRS and the University of Florida’s Fort Lauderdale Research and Education Center. Strategies for managing LY focused on replacing disease-susceptible, tall coconut varieties with resistant dwarf types. When state funding ended, the germplasm collections of coconut persisted and eventually were incorporated into the National Plant Germplasm System. When geneticist Alan Meerow joined ARS in 1999, he began to review the coconut germplasm at SHRS. Fiji Dwarf (also known as “Niu Leka”) emerged as the prized jewel among the varieties because of its heavy, dense crown of short, dark leaves—features sought by ornamental growers, landscapers, and gardeners. Since then, Meerow and SHRS horticulturalist Tomas Ayala-Silva have continued to work with this variety with the tropical landscape horticulture industry in mind. Fiji Dwarf’s exact origins are unknown, but the oldest known introductions came from the South Pacific. It looks like a tall coconut variety with a swollen trunk base. It has outcrossing reproductive behavior—a process that introduces unrelated genetic material into a breeding line, which reduces the probability of individual palms being subject to disease or genetic abnormalities. Fiji Dwarf also bears large fruit but lacks bright-red-fruited and yellow-fruited phenotypes. It has shown variable resistance to LY in Florida, but it is free of the nutritional deficiencies that plague most other coconut varieties grown on Florida’s relatively infertile soils. Since 2001, the SHRS researchers have been using molecular tools to investigate the genetics of Fiji Dwarf and other varieties. Meerow and Silva want to know whether it’s possible to identify an LY-resistant Fiji Dwarf genotype. So far, data indicates that Fiji Dwarf has the second-highest gene diversity among the varieties after the talls—such as Panama Tall—and the largest number of unique genes of any cultivar group within the study. Moreover, in the past 8 years, not a single Fiji Dwarf has died of LY at SHRS. It is possible that the material now being cultivated at SHRS represents fully resistant stock, but further research needs to be done to confirm that. At present, there is no LY screening program at SHRS, so these observations remain anecdotal. ARS scientists are now working with the Dade Chapter of the Florida Nursery, Growers & Landscape Association to develop seed-production orchards in South Florida with genotyped stock of Fiji Dwarf and perhaps other varieties.—By Alfredo Flores, Agricultural Research Service Information Staff. Alan W. Meerow and Tomas Ayala-Silva are with the USDA-ARS Subtropical Horticulture Research Station, 12501 Old Cutler Rd., Miami, FL 33158; phone (786) 573-7075, fax (786) 573-7110. This research is part of Plant Genetic Resources, Genomics, and Genetic Improvement, an ARS national program (#301) described on the World Wide Web at www.nps.ars.usda.gov. "Fiji Dwarf Sets New Durability Standards in Coconuts" was published in the May/June 2008 issue of Agricultural Research magazine.